Mountain Climbing by Bike?!! The First Time. 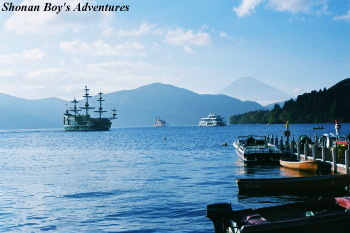 I went to Hakone on 4 Nov 2000 by bicycle. It is situated in west part of Kanagawa prefecture. At 5:30, I departed from my house, and went through Kamakura city (at 6:45, 22km) & Katase-enoshima (at 7:00, 30km). From Hakone-yumoto station of Hakone Climbing Railways (70km), I went up steep slope (departed at 9:40). 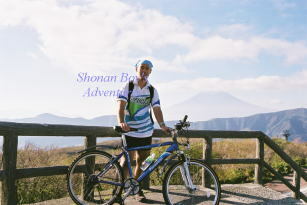 I had a very hard time during I rode bicycle from Hakone-yumoto through Owakudani. In Japan, Hakone is famous for hard part. 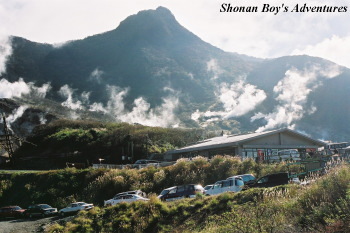 Many eggs are boiled here in the hotspring. You can eat black egg?!! At 12:40 (86km), I arrived at Owakudani (11 degrees centigrate, about 50 degrees Fahrenheit), about 1200 meters above sea level. 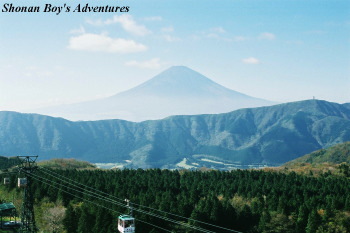 Torists go there by climbing train, transfer to cable car, then transfer to ropeway. Others go there by bus. When I arrived at Owakudani, some torists surprised to see me, "Oh, by bicycle! (Unbelievable!)" Mt. Fuji is on the right. It did NOT mean refusing me entry into the country !. Then I went to the Remains of Hakone checkpoint (restored). In 1619, it was established, but now it is museum. When people went through it, they needed passport. If they broke through checkpoint, they were killed (the death penalty). It reminds me of the wall of Berlin, Germany. 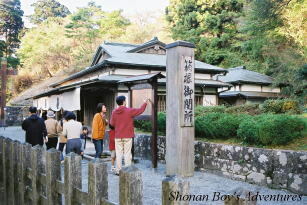 The word "Kanto" comes from east of Hakone checkpoint. And the word of "Kansai" comes from west of Hakone checkpoint. (Mt. Fuji is on the right.) Difficult to go home! When I came back, I went down steep slope of old Tokaido (Tokai road). I worried about breaks of my bicycle (heat). Top speed was 53.8 km/h there. There were many hairpin bends. So I stopped twice on the way because the brake of my bike was hot. I enjoyed bathing of hotspring in Hakone while I went back home. Tokaido (Tokai road) was constructed from Nihombashi Edo (present Nihombashi, Tokyo) to Kobe (present Kobe, Hyogo prefecture), in the Middle Ages. That's why Tokaido (Tokai road) was important. At present there are expressway, Tokaido line and Tokaido Shinkansen. I ran 188km (116.8 miles) by bicycle at that time. My legs had been muscle pain for 5 days. But I had a good time. It must be my history.